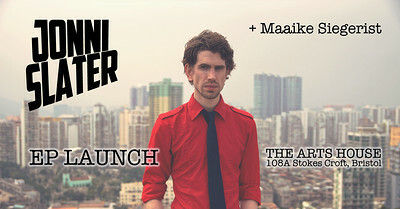 Jonni Slater launches his new EP, with support from Dutch singer-songwriter Maaike Siegerist. Jonni Slater is launching a new EP in the cosy basement room at the Arts House Cafe, with a live performance including video projections. Support comes from Maaike Siegerist, playing a set of her own songs and then joining Jonni for his set on guitar and backing vocals. £4 in advance from this site, or £5 entry on the door. Ticket price includes a free download of the EP (available on launch night). Jonni Slater’s music ranges from intimate and heartfelt to uplifting and cinematic, mixing a love of dramatic soundscapes with classic songwriting. He performs live with electric guitar or piano-based songs supported by electronic loops, breaks and ambient sounds. “a talented, kaleidoscopic and charismatic song-writer"
"Slater’s music ... tends to start building block upon block until it towers by the end"
Maaike Siegerist is a Dutch jazz and "dark folk" singer-songwriter based in Bristol. Classic jazz, Argentine folk and gothic influences blend in the songs she writes on her Spanish guitar. Her voice is reminiscent of the American folk singer Joan Baez and Portuguese fado singer Cristina Branco. Maaike released her debut album Born Before the Wind in 2017, which has had airplay on BBC Radio 6 Music.